THE BASICS OF STREET PHOTOGRAPHY. In my last blog post I talked about daily shooting and the benefits of doing such an activity. Granted as I mentioned in that post, not everyone can go out on a daily basis and go photograph all or part of a day. Or find a subject to photograph on a daily basis too. Street Photography is simply photography that features subjects in candid situations within public places. It does not even need the presence of a street or even the urban environment. The subject of the photograph might be absent of people and can be an object or environment where the image projects a human characteristic. Framing and timing are key components of street photography, for the aim is of creating images at a decisive or poignant moment. Simply put… You wait for the moment to happen in front of you. And it’s really not that hard or long a wait when you have people interaction happening all around you in a public area or space. A perfect example of that is the following. 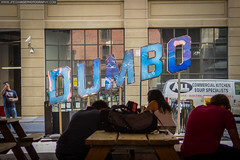 Over this past weekend I had gone to the DUMBO Arts Festival located in Brooklyn, New York. It’s held every year by the Brooklyn waterfront between the Brooklyn and Manhattan Bridges of New York City. In a park known as Brooklyn Bridge Park and the surrounding neighborhood known as Vinegar Hill. Dumbo is an acronym for District Under the Manhattan Bridge Overpass. Nowadays it’s home to lots of local artist and small businesses giving the area a unique look with random art posted across the area. Below are what I think are good examples of street photography. And the DUMBO Arts Festival was the perfect place to use for street photography. The photo below is an example of just standing on a street corner with your camera, and photographing human interaction of people at an event. 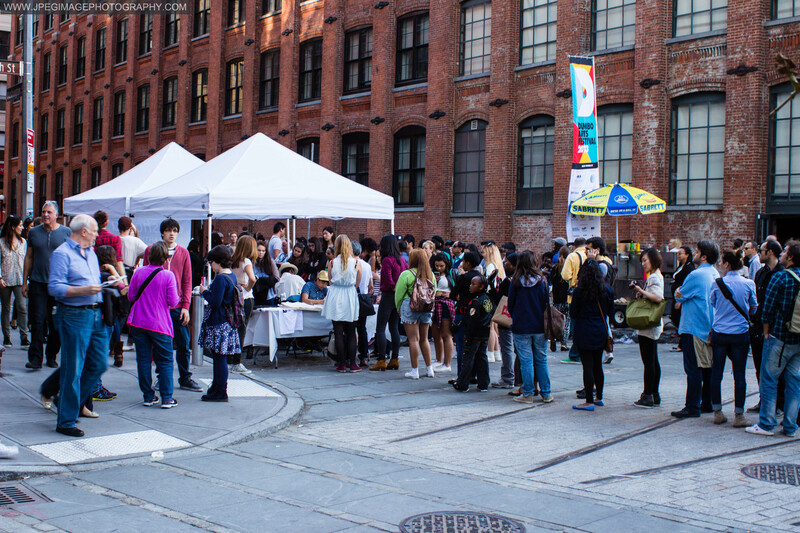 Crowd of people during the DUMBO Arts Festival located in DUMBO Brooklyn, Sunday September 29, 2013. The next photo below is another good example of photographing human interaction of people at an event. I just stood in the middle of a large crowd, in the middle of a closed street during the arts festival and I just photographed people as they just walked by me. 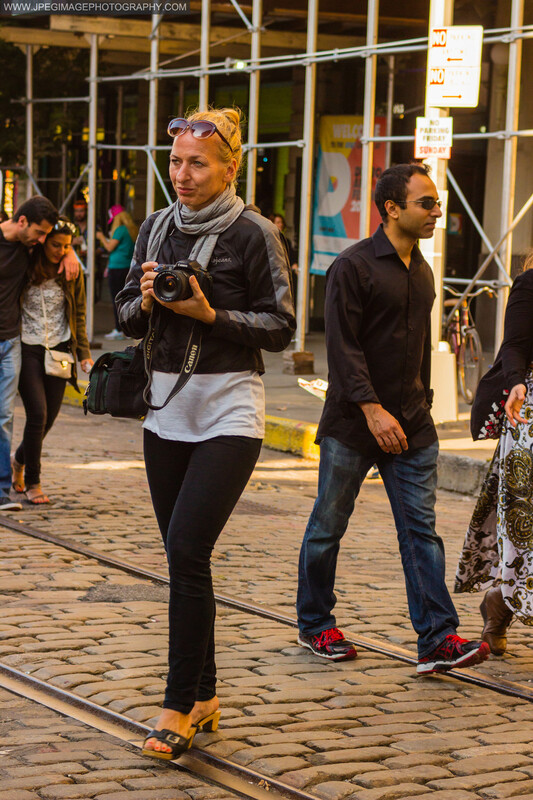 Woman walking around taking photos of the DUMBO Arts Festival located in DUMBO Brooklyn, Sunday September 29, 2013. In the next photograph I was just standing around on a random street during the festival when I noticed the couple and thought to take a quick photograph of them. Once I had gotten home to review my work. I had noticed that I had framed the photo quite well. The couple was the subject within this crowd of people while at the same time telling a story. A very short story of two people at an event with one person wanting to review the photo they had just taken, while the other person views and explore the crowd to see what’s next for them to look at during the event. Two people taking photographs and reviewing photos, during the DUMBO Arts Festival located in DUMBO Brooklyn, Sunday September 29, 2013. The next photo is a perfect example of framing and timing that are the key components of street photography. Originally the photo was just to be taken of the artwork that was hanging on the gate with no body around. The couple on the lower right without any warning just walked into the frame of my shot and sat down on the window ledge. At that moment it became a decisive or poignant moment for the photo for it shows a human element of just two people taking a quick break from walking and taking the time to talk to each other. 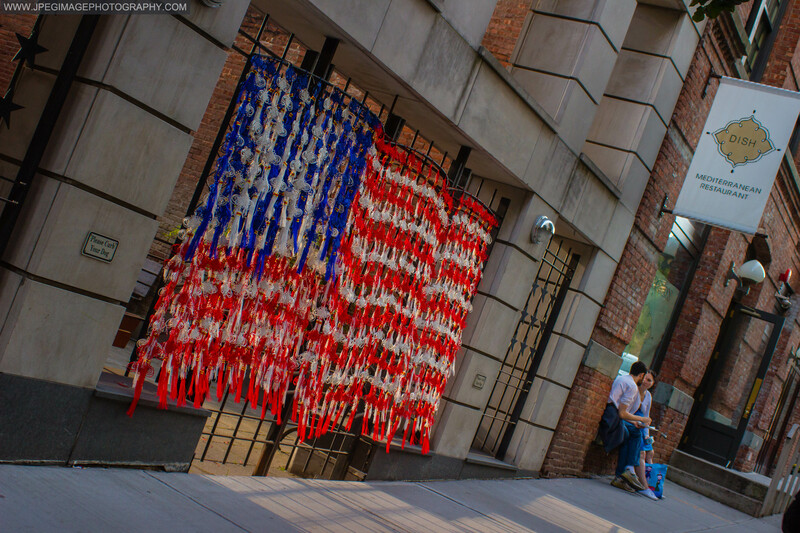 Tassels hanging on a gate made to look as the flag of the United States, as an artist work is shown during the DUMBO Arts Festival located on Washington Street in DUMBO Brooklyn, Sunday September 29, 2013. Street photography does allow one to capture unique moments too. 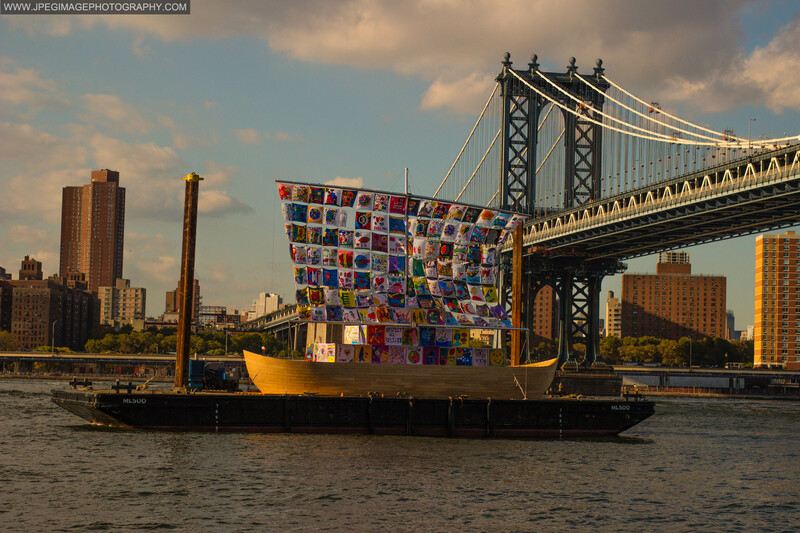 Such as this floating artwork that was on the East River, the bridge in the background is the Manhattan Bridge. Ship of Tolerance exhibit on display in the East River of New York City during the DUMBO Arts Festival located in Brooklyn Bridge Park DUMBO Brooklyn, Sunday September 29, 2013. Another unique moment is the one blow. A female artist posing/sleeping on a bed as “live art.” This drew quite a large group of people towards it. Female artist posing/sleeping on a bed as “live art” at the DUMBO Arts Festival in Brooklyn New York, Saturday September 28, 2013. But as you can see, just by walking about and photographing what’s around you does make at times for a very interesting photo. And there you have it…. Street Photography. Hope this post helps you the next time you go out with your camera, and you wonder what to photograph next.